In Serbia is charged passage highway sections through charges levied at toll gates. Tolls are levied not only on drivers of passenger cars and trucks, but also from the drivers of motorcycles and tricycles. Tolls can pay by credit card, cash in local currency (Serbian Dinar), and in some cases also in euros. 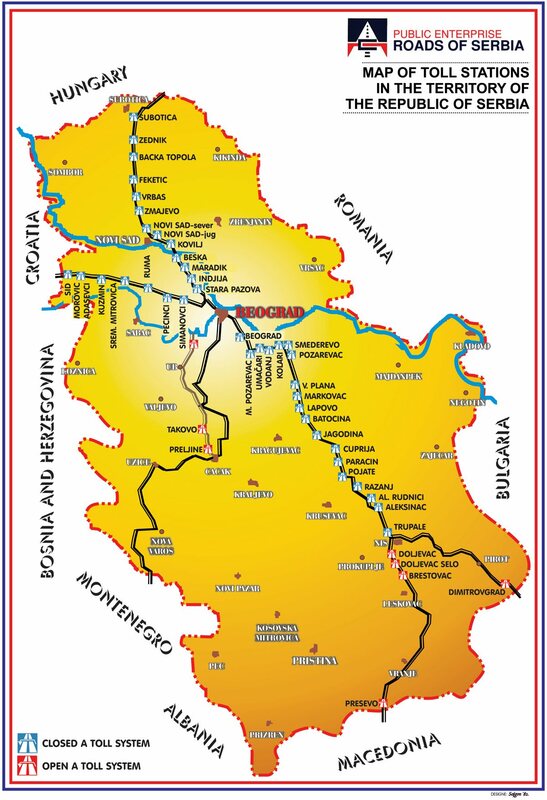 Among the most popular sections include the toll highway between Subotica near the border with Hungary and Leskovac near the border with Bulgaria and FYROM. For more information, including maps, price lists of individual sections and links to official presentation can be found below on this page. When you pass through the Serbian motorway, you will be paid at the beginning of the section printed ticket with the place, date of entry and vehicle category. Based on this certificate will be paid when leaving the toll section calculated. If the coupon during the journey you lose, you will be charged a fee for crossing the longest possible period. Tolls can be paid in several ways, in cash, in some cases (greater amount) can pay in euros, may not be accepted coins. Another option payment is one of the commonly used credit cards (MasterCard, Maestro, Visa, American Express, Diners and DinaCard) or automatic toll payment E-go. More information on the putevi-srbije.rs. A system for automatic toll payment ETC - E-go, it works like in most neighboring countries. It is an electronic device with which it is monitored by the passage of individual toll gates. The advantage of this system is the possibility of smooth transit toll gates without stopping the vehicle. This is the type of prepaid system before using the account can be conquer a certain amount of which will be in transit each highway toll gates deducted fee. For more information including documents for ordering equipment and instructions for use can be found on www.putevi-srbije.rs, tabElectronic Toll Collection. In Serbia, persons with disabilities the opportunity to ask for a magnetic card which entitles to pass selected highway sections for free without paying a toll. The card is valid only if it is a registered user present in the vehicle. It applies to sections of Belgrade - Nis, Belgrade - Sid and Belgrade - Subotica. When applying for this card is obviously necessary in person or by mail to deliver all officially certified documents proving disability. If interested in this card is recommended to ask for more information via e-mail indicated on page Toll-free motorway permits. For drivers of vehicles over 3.5 tons pays for the payment of toll fees the same rules as drivers of vehicles under 3.5 tonnes. Distribution of vehicle categories according to weight, height and number of axles, see the table at the price list.